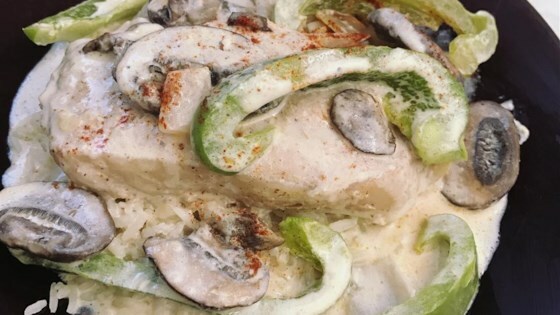 "This is my recipe for pork chops baked in the oven with green bell pepper and onion then covered in a mushroom cream sauce and served with rice. This recipe was made in a Panasonic CIO and appears on an episode of the Dinner Spinner TV Show on The CW!" Combine water, rice, and 1/2 teaspoon salt in a saucepan; bring to a boil. Reduce heat to low, cover, and cook until rice is tender, about 20 minutes. Remove from heat and add 1 tablespoon butter; stir until rice is fluffy. Place pork chops in a 9-inch baking pan (or grill pan if using the countertop induction oven). Drizzle olive oil on top. Sprinkle Creole seasoning, salt, and pepper over both sides. Arrange green bell pepper and onion slices on and around pork chops. Bake in the preheated oven until an instant-read thermometer inserted into the center reads at least 145 degrees F (63 degrees C), about 20 minutes in the conventional oven and 10 to 15 minutes in the countertop induction oven. Cover with aluminum foil. Melt 1/4 cup butter in a large skillet over medium heat. Add mushrooms and chopped onion; cook and stir until onion is translucent, about 5 minutes. Pour in half-and-half. Stir in flour slowly; cook and stir until sauce thickens, about 5 minutes. Pour sauce over pork chops; stir to incorporate juices in the pan. Return pork chops to the preheated oven and bake until flavors combine, 3 to 5 minutes. Serve over rice. Sprinkle paprika on top. Very tasty! I always love the green pepper-pork chop combo. Only change is I added more mushrooms. Will make again! This is a great, homemade weeknight meal. I don't usually make cream sauce, but this one was really nice. And the peppers and onions add a nice crunch to the dish.